This short book is an excellent introduction to French and British politics in the 1790s, as well as an accurate and readable portrait of a key subset of French political figures. It focuses on the small group of aristocratic leaders known as the constitutionalists, who earned the loathing of both the royalist and the Jacobin factions during the French Revolution for their advocacy of a middle way. The constitutionalists tried to promote a limited monarchy with the protections of a constitution for the people of France, while the royalists wanted a return to the ancien régime and the Jacobins were thirsty for blood.You would have imagined that this position, basically an endorsement of the British system of government, would earn them the support of British officialdom; but it did not. The constitutionalists—Narbonne, Talleyrand, Jaucourt, Lally Tollendal, and a few others, plus their female counterparts including the Princesse de Hénin, Mme. de Staël, Mme. de la Châtre, and so on—were suffered to enter Britain but watched and suspected and, several of them, ultimately ejected from the country. British political discourse in the 1790s painted the French with a broad condemnatory brush, erasing the deep political divisions among factions, and all were suspect.In this tenuous environment, the idealistic constitutionalists for a brief while were able to create a Camelot for themselves in the county of Surrey. They let a house—the Juniper Hall of the title—near Dorking and lived there in elegant poverty for about a year before the tides of history shifted and they scattered, some to America, others to Switzerland, a few to return to France. They were sophisticated, charming, and erudite, and a handful of their neighbors gave them welcome and offered them the respite of good society. 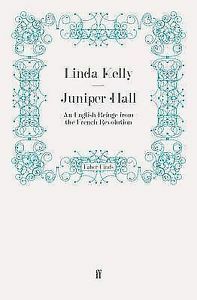 One, novelist Fanny Burney, even fell in love with and married one of the French refugees.Linda Kelly paints a vivid portrait of this group, rich in detail and impeccably researched. She doesn’t overwhelm the casual reader with documentation (there are no footnotes), instead offering a narrative that reads almost like a novel. If you are interested in the period of the wars with France (Napoleon had not yet ascended to power), this book is fascinating to read. Popular history doesn’t get any better than this.